Welcome to By-Die-Koppie Guesthouse website! By-Die-Koppie Guest House offers affordable overnight accommodation in Prince Albert, Western Cape. We invite you to come and experience the peace and tranquility of this homely guesthouse, approximately 40km off the N1 between Beaufort West and Laingsburg. By-Die-Koppie Guest house is located on the edge of town providing an easy opportunity to go for relaxing walks in the veld. We are “by die koppie” (close to the hill) from where picturesque sunsets and sunrises can be appreciated. Additionally you are in close proximity to the Swartberg Pass with its stunning vistas and the beautiful drive that is Meiringspoort. We offer peace and quiet and true country-style hospitality. By-Die-Koppie caters for families, business travellers as well as week-end explorers searching for accommodation at the foot of the beautiful Swartberg mountain range. We have four unique rooms each offering you space and time to escape from the rat race. 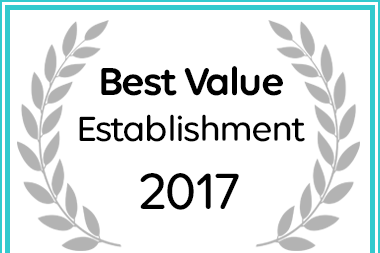 By-die-koppie – Prince Albert has been named a Best Value Prince Albert Establishment.